What do you use to capture all those great 3D scans you’ve been publishing? For this challenge we’re putting the focus on our process and capturing a piece of equipment – tripods, turntables, cameras, laser scanners, etc. – that we use to bring our models to life. But how will you capture a piece of your equipment when you need it to make the model? Therein lies the challenge! Time for some creative 3D capturing. Scan a piece of equipment that you use to create 3D scans with your preferred scanning workflow. Once you’ve created your scene, upload it to Sketchfab, tag it #ToolsOfTheTrade. 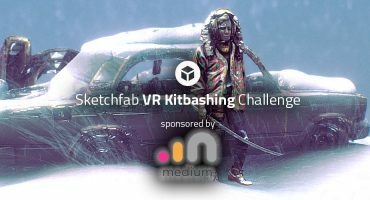 Contestants models must be uploaded to Sketchfab and tagged #ToolsOfTheTrade to be considered. The winners will be contacted by Friday, June 22nd. This is quite a challenge since everything peice of equipment i have is smooth, shiny, and has black parts, all of which are difficult to scan.